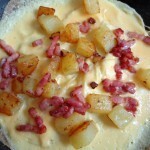 This recipe is a variation on the traditional omelette bonne femme, which typically contains potatoes, bacon and onions. The arugula is a modern touch. Feel free to experiment: you can add cheese for a richer omelet, or omit the bacon for a vegetarian version. Or use your imagination. As presented below, the recipe makes a single omelet — a meal for one if accompanied by a salad, fresh bread and perhaps a glass of wine. If cooking for two, double the ingredients and make either one large omelet, to be cut in half just before serving, or back-to-back single omelets — they’re ready so quickly that they may be served together without the risk of one getting cold while the other is cooking. For best results, use firm potatoes that will hold together when steamed or boiled. Start by peeling your potato. If you have a steamer, cut the potato in half lengthwise and cook it over boiling water for 15 minutes, until it is just tender. Otherwise boil the potato whole for 20 minutes, until it is just tender. While the potato is cooking, prepare the other ingredients: If the bacon is not already cubed, remove the rind and cut it into crosswise strips. Break the eggs into a bowl, add the water and whip until the eggs are light and frothy. Cut the arugula leaves crosswise into bite-sized pieces. When the potato is tender, cut it into cubes. Heat the olive oil to sizzling in a nonstick frying pan. 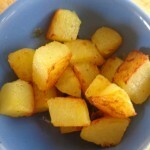 Add the potato cubes, turn down the heat to medium and sauté about 10 minutes, until the cubes are turning golden. Remove the cubes and set aside. In the same pan, now cook the bacon. Turn up the heat to medium high and add the cubes. Stir frequently. You want to bacon to be starting to brown without getting overly crisp. This takes about 5 minutes. When the bacon is ready, drain through a sieve over the sink. You are now ready to make the omelet. Before proceeding make sure you have set the table, as the next stage goes very quickly. In a fresh frying pan, preferably an omelet pan, melt the butter over medium-high heat. When it is sizzling and just starting to brown, swirl the pan around so that the butter covers the bottom completely and coats the sides about halfway up. Add the eggs and swirl to cover the pan. The eggs will begin to set almost immediately. Turn the heat down to medium and, with the help of a wooden spatula, gently lift the edge of the omelet and tip the pan to allow runny eggs to slip beneath the eggs that have set. Repeat twice at different parts of the pan. 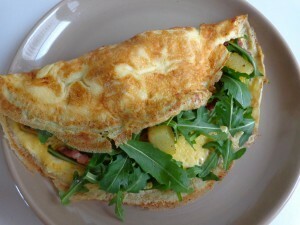 Now add the other ingredients to the omelet: first the potatoes, then the bacon, season with salt and pepper, and finally, when the omelet has set almost completely, add the arugula. Use your spatula to help slide the omelet out of the pan onto a plate, flipping the top half over the bottom. Serve immediately. Serves 1.